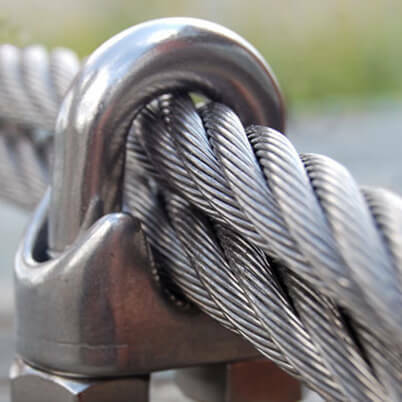 Wire rope grip in marine grade stainless steel, strong and hard-wearing clamp for creating loops in stainless steel cable, easy to install and is ideal for highly corrosive environments. 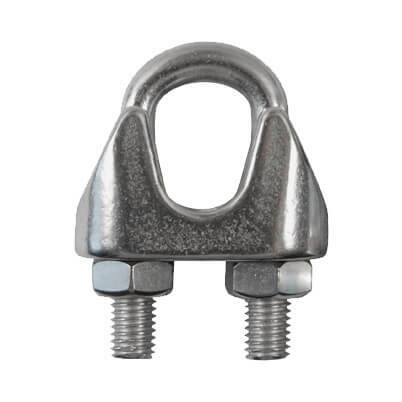 Please note: Wire Rope Clamp Size relates to the Wire Diameter. E.g. For 4mm Wire Rope please choose a 4mm Wire Rope Grip. To a high quality finish. Wire Rope Grips are used on wire rope eye-loop connections or complete loops, end-to-end connections, where socketing or splicing is not feasible or when a temporary joint is required. Ideal for stainless steel rope, not for use with plastic coated wire rope. 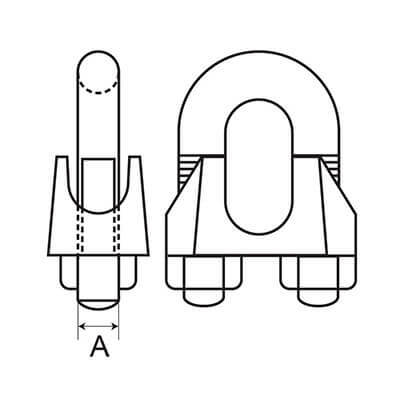 Before installation it is best to check you have the correct size clamp to match your stainless steel wire rope. Incorrect matching could result in serious injury or damage. To create a simple loop or thimble loop, turn back the required amount or wire rope to create your loop. Starting approximately one grip base width in from the dead end of your rope place the U-bolt over the dead end and attach the grip base. Apply the fixing nuts - taking time to alternate between the two nuts as you tighten to ensure an even fixing. For instances where you need to use 2 wire rope grips. Repeat the same instructions as above, placing the second grip as close to the thimble or loop as possible. Ensuring you place the U-bolt over the dead rope and fixing the grip base evenly. When using three or more clamps ensure you have spaced them evenly, making sure you have taken up any slack in the rope between the two end grips before tightening your additional rope grips. Once fitted we recommend you load test your wire rope assembly with a load that is equal or greater than the expected load. Check that all the nuts are secure. Easy to attach, strong fixing. The Wire Rope Grips I bought are very good quality with smooth finish (unlike some I bought from a DIY store). Exactly what I needed. Prompt and excellent service. Very well made and did the job perfectly. These do the job but are a bit fiddly. You need more than 2 hands and nimble fingers. For some reason I got sent 2 sizes, the smaller ones are really fiddly with a 5mm nut. They may be the size I ordered, but my recommendation to anyone reading this is get the ones with the 7mm nut! Work well but donâ€™t drop the nuts - they are very small and take some finding especially in the garden. Stainless steel marine grade so should last well in the garden where I've used them. The 3mm version does require a small spanner (5.5mm) which took a bit of finding. Including one with the pack would be a value-added gesture. Excellent price and product Only issue was needing a very small adjustable or spanner. A cheap spanner option would have been good or at least a heads up in advance. Good quality, they work. S3i could supply a suitable socket spanner to make the job even easier. Good quality and grips the rope really securely. Great quality perfect for the job I needed them for. High quality components that matched the description. Does its job. The bolts are a bit fiddly as they are small. These work well, they are fiddly to install and I lost several nuts in gravel but if you can avoid those pitfalls they work really well. Nice item and exactly what I wanted. Great product! I will always think of the S3i group when I'm tightening my nuts. Good little grips for clamping off the rope..
Wire Rope Cutters for stainless steel wire and cable.